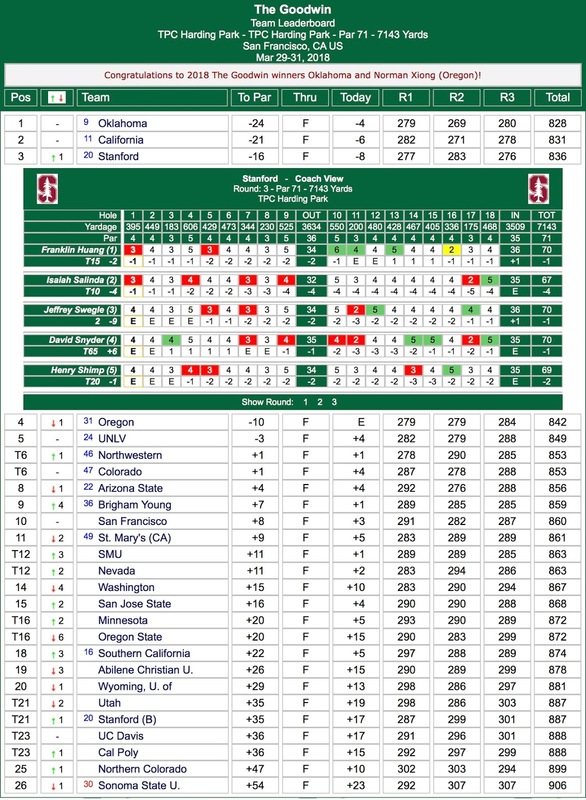 Stanford finish third on Saturday in the 49th edition of The Goodwin at chilly TPC Harding Park Golf Course. 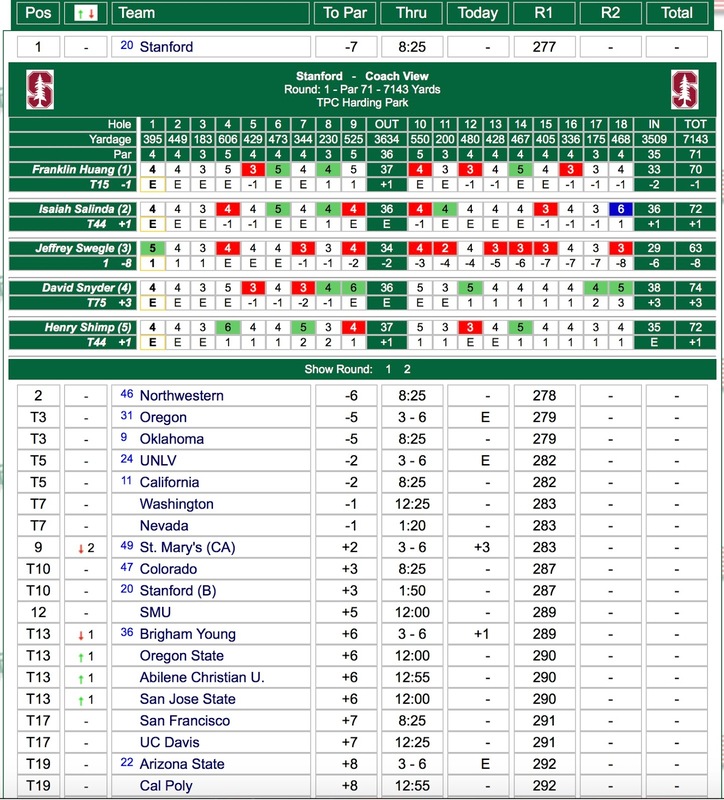 Of special note is that Swegle first round tournament low score of 63 leaves him only trailing 4 other lower rounds in the history of Stanford men's golf - behind only rounds of 61 by Tiger Woods, Maverick McNealy and Cameron Wilson and a 62 by Notah Begay. No. 8 Oklahoma won the tournament with an impressive 54-hole score of 24-under 828, while No. 10 Cal claimed second at 21-under 821. Jamie Cheatham celebrated his birthday by helping the Bears clinch the runner-up spot with a hole-in-one at the par-3 17th. The Cardinal concluded at 16-under 836, combining for an 8-under 276 on Saturday, the low score by two shots. "A super-positive day," said Knowles Family Director of Men's Golf Conrad Ray. "I thought it played pretty tough and was the hardest day we had. Our guys all turned up and it was a team effort. That's what I challenged the guys with, to try and have their scores count and be competitive with each other." Norman Xiong of Oregon (65-65-68) won individual medalist honors by six strokes over Swegle with a score of 15-under 198. After two unseasonably warm days that enabled many of the 26 participating teams to play in shorts, the fog rolled in and the sun was a distant memory. Layers were the order of the day. The Cardinal didn't mind. All five players broke par, led by junior Isaiah Salinda, who fashioned a 67 thanks to five birdies and only one bogey. Starting the final round in fourth place, 12 strokes behind Oklahoma, the No. 18 Cardinal got off to a fast start as all five players turned under par. Salinda led the way with a 4-under 32, while Henry Shimp, Franklin Huang and Swegle added 34s. "We had a great front nine today," Ray said. "We gave a couple back on the back, and it got pretty cold and windy. Hats off to Oklahoma. They've got a good team and they're well-seasoned." Swegle's previous top finish on The Farm was a tie for ninth in 2016 at the NCAA Regional Championships. He began the tournament with a scintillating 63 on Thursday, matching the fifth-lowest score in program history. "Neat to see him finish second," Ray said. "I walked with him today and he was really solid. Hopefully, there's some good things to build on." Swegle closed with a 70 to garner his third top 20 of the season. See Swegle's three round scorecards below resulting in his career best finish. Salinda tied for 10th at 4-under 209, while Huang (70) tied for 15th at 2-under 211. Shimp (70) earned a share of 20th at 1-under 212. Competing with the White team, Brandon Wu (71) tied for 27th at even par 213. David Snyder (70) and Ashwin Arasu (77) tied for 65th, followed by Bradley Knox (74), who tied for 92nd. Christopher Meyers (82) tied for 130th and Dakota McNealy (79) finished 135th. The Cardinal returns to action next Saturday and Sunday in the 72nd annual Western Intercollegiate at Pasatiempo Golf Club in Santa Cruz, California. Hosted by San Jose State, it is one the longest-running collegiate events in the country. Fifteen teams will compete, playing 36 holes on Saturday and 18 on Sunday. "Pasatiempo is a phenomenal golf course," said Ray. "We look forward to it every year." 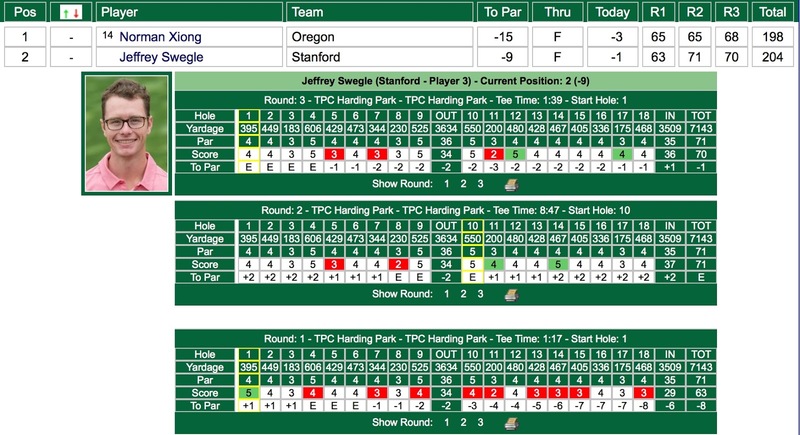 SAN FRANCSCO, Calif. – The 18th-ranked Stanford men's golf team needs a Saturday charge to successfully defend its crown in the 49th Goodwin tournament at TPC Harding Park Golf Course. TPC Harding Park, renovated in large part through the efforts of Stanford Hall of Famer Sandy Tatum, has hosted a President's Cup event and will host the PGA Championship in 2020. The Cardinal surrendered its first-round lead to No. 8 Oklahoma on Friday, posting a best four-out-of-five player score of 1-under 283. It took a resilient finish to do it. "I'm happy for the guys," said Conrad Ray, the Knowles Family Director of Men's Golf. "They hung in there. They played some hard holes pretty well. At one point, I think we were 5 or 6 over. We're still in it." 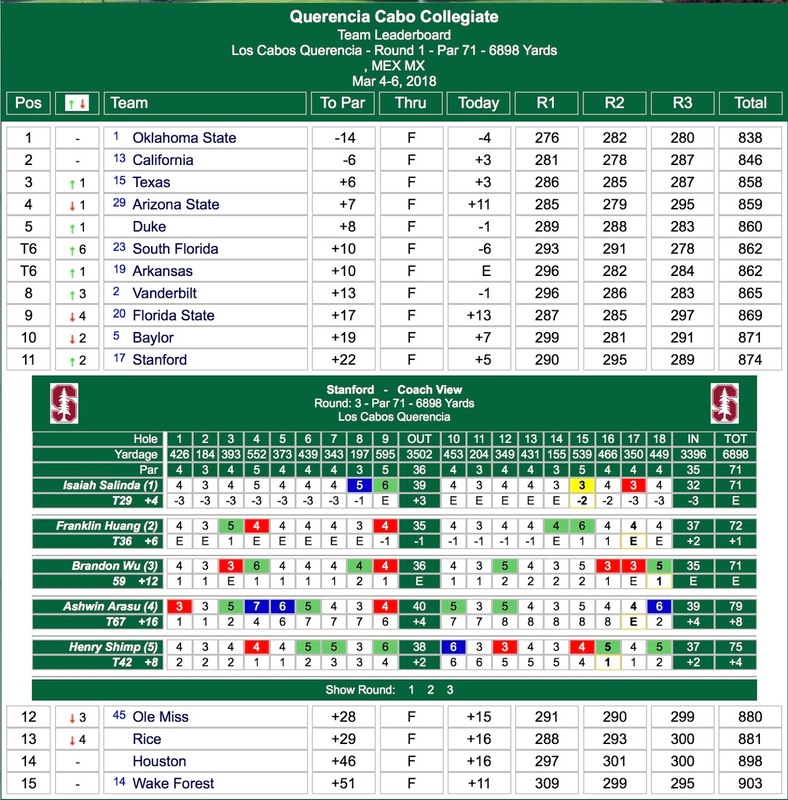 The Sooners combined for a 15-under 269, as four players broke par in calm, partly cloudy conditions. Oklahoma has a 36-hole total of 20-under 548, followed by No. 10 Cal (553), Oregon (558) and Stanford (560). "It's out there," Ray said of another low team total. "You saw that with the scores Oklahoma and Cal (-13) put up today. I'm glad there are three rounds." The event is named after long-time Stanford golf coach Wally Goodwin. Twenty-six teams are competing in one of the strongest men's fields of the season. Swegle's career-best round on Thursday matched the fifth-lowest in program history. 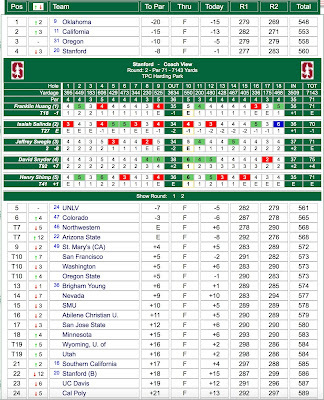 Junior Isaiah Salinda and freshman Ashwin Arasu tallied sub-par scores for Stanford with 1-under 70s. Salinda forged a team-high six birdies and Arasu added four. They are tied for 27th at even-par 142 with teammate Brandon Wu (73). Franklin Huang (70-71) is tied for 18th at 1-under 141. Henry Shimp (72-71) is knotted for 41st at 1-over 143, while David Snyder (74-75) and Bradley Knox (72-77) are tied for 92nd at 7-over 149. 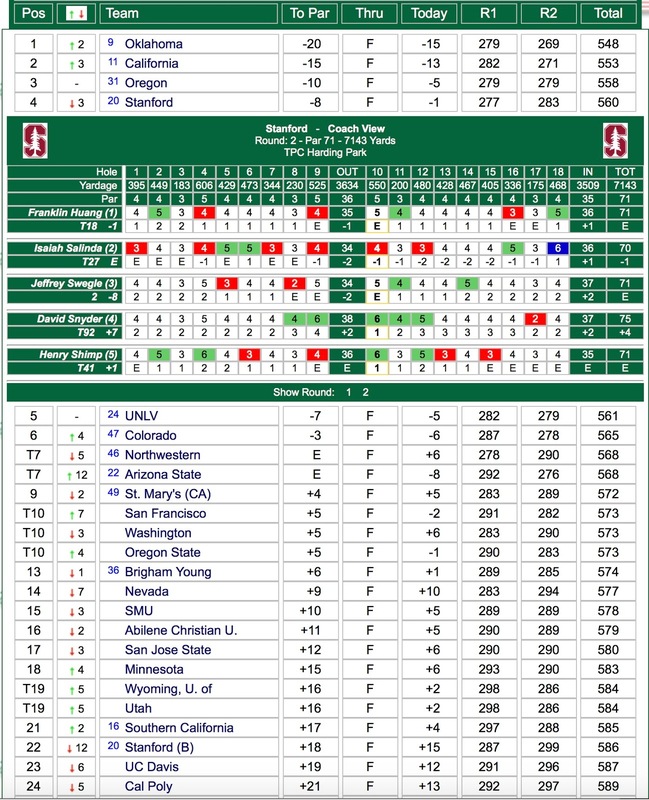 Christopher Meyers (74-79) is tied for 118th and Dakota McNealy (80-81) is 134th. San Francisco, Calif. – Jeffrey Swegle didn't see it coming. Struggling with his game coming into the 49th Goodwin tournament, the Stanford senior blazed a career-best 8-under 63 on Thursday at sun-baked TPC Harding Park Golf Course. He fashioned nine birdies and one bogey – a three-putt on the par-4 first hole – then played flawlessly the rest of the way, hitting 17 greens in regulation. "I've honestly been playing terrible for the last three weeks," said Swegle, whose previous low was a 7-under 64 at the 2016 Pac-12 Championships. "Franklin (Huang) and I were just laughing because we played three days ago with two other guys and they were concerned I wasn't going to break 75 this week." "I started hitting it better yesterday," Swegle said. "I really love this course. It's my senior year and I really hadn't been playing that well the last couple months. My mindset was just to go out and enjoy my last home tournament." Swegle hit it close a few times and also buried several putts from 20 feet or longer. He capped the day by flagging a 9-iron to 10 feet at the tough par-4 18th hole and drained the birdie putt. His inspired performance lifted the No. 20 and defending champion Cardinal into the first day lead with a 7-under total of 277, one stroke ahead of Northwestern and two in front of Oklahoma and Oregon in the 26-team, 54-hole event. "I'm happy for the guys," said Conrad Ray, the Knowles Family Director of Men's Golf. "There's a lot of golf left on a demanding course. Jeff played great, but the guys felt they left some shots out there, so hopefully there's better golf ahead." Making the most of the 75-degree, mostly windless day, Swegle earned the individual lead by one shot over Norman Xiong of Oregon. Forty-four players shot par or better. 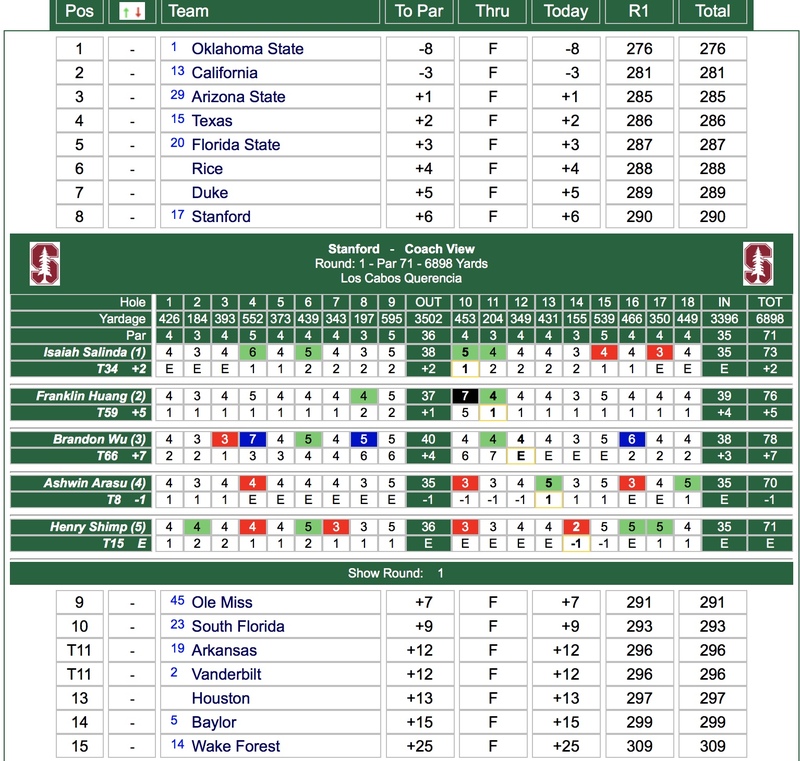 The Stanford White team combined for a 3-over 287 and is tied for 10th. Brandon Wu shot 69 and is tied for 10th, while Huang (70) is knotted for 16th. Isaiah Salinda, Henry Shimp, Bradley Knox and Ashwin Arasu posted 72s and are tied for 45th, while Christopher Meyers and David Snyder added 75s and are tied for 75th. Dakota McNealy (80) is tied 133rd. 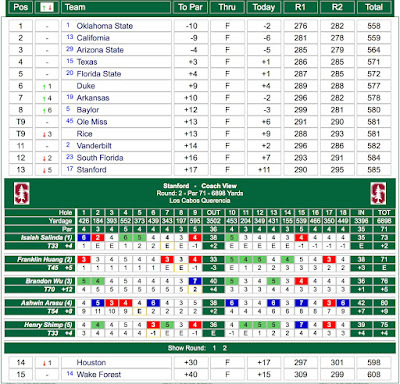 Round one team scoring is shown below including Stanford scorecards. The Cardinal moved up two places and finished 11th, 36 strokes behind the winning Oklahoma State team after a final round, 5-over par 289 total. 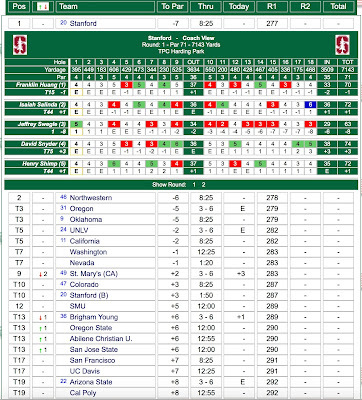 Stanford was led by sophomore Isaiah Salinda who finished tied for 29th 4-over par with rounds of 73-73-71 217. Cal's Morikawa was the individual champion with an impressive 16-under par 197 total. Franklin Huang tied for 36th totaling 219 on rounds of 76-71-72, Henry Shimp tied for 42nd at 221 with rounds of 71-75-75, Brandon Wu finished 59th at 225 with rounds of 78-76-71 and freshman Ashwin Arasu ended tied for 67th at 229 on rounds of 70-80-79. 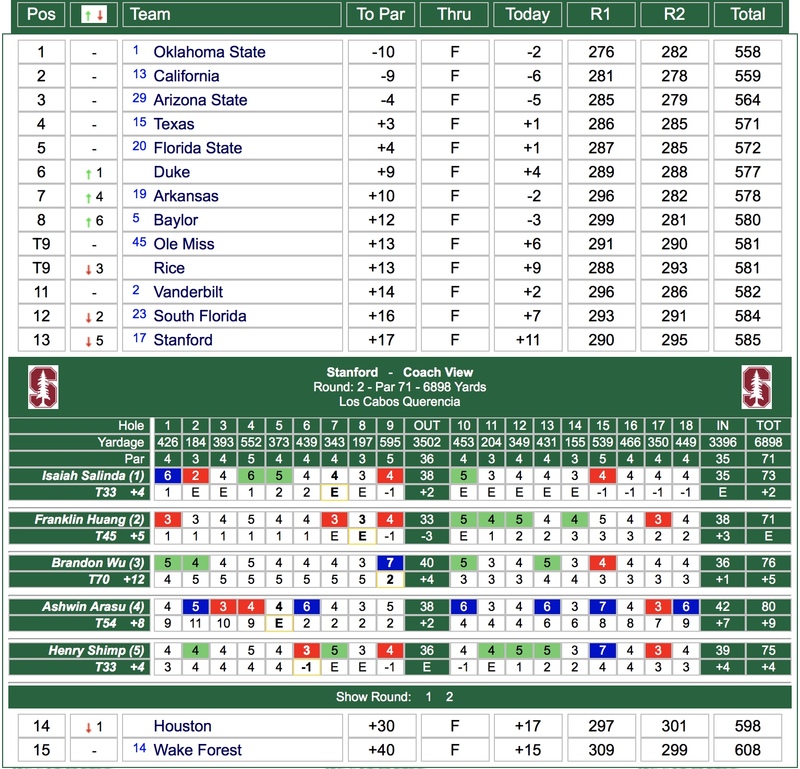 Team scoring and Stanford's final round scorecards are shown below - click on image to enlarge. 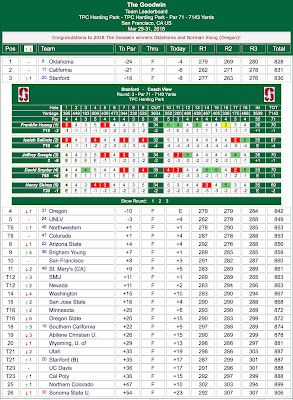 A disappointing second round 295 team total (11 over par) slid Stanford from a tie for 8th to 13th. Franklin Huang (76-71 147 T45) was the team's low man on the day with an even par 71 as his four birdies offset four bogeys. Isaiah Salinda with 73-73 146 and Henry Shimp with 71-75 146 left them tied for 33rd individually. 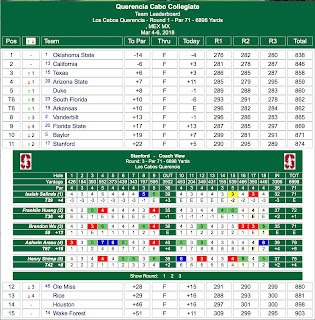 Cal's 278 total on the day was the best in the field and they trail leader Oklahoma State by one. Look for a strong final round from the Cardinal to finish with some positive momentum. Second round scoring is shown below - click on the image to enlarge. 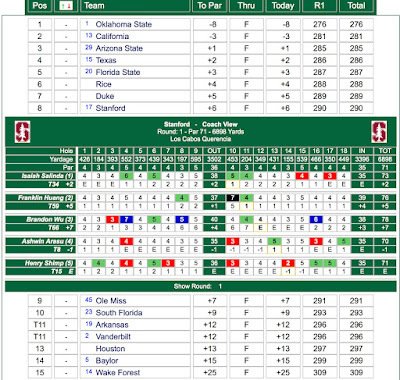 There is work to be done after round 1 is in the books with Stanford 14 strokes behind leading Oklahoma State. The Cardinal was led by freshman Ashwin Arasu with a fine 70 to put him in a tied for 8th overall. Sophomore Henry Shimp followed with a solid 71 leaving him tied for 15th.